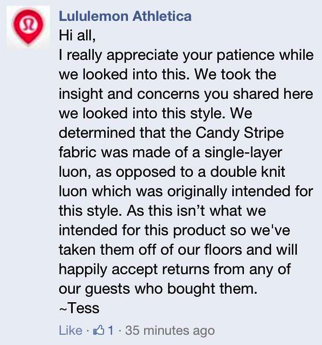 As a result of this post the other day about the incredibly sheer Candy Striped Wunder Unders, and the backlash lululemon got on their facebook page, today they issued a statement on facebook in response to customer complaints. The Candy Striped/Aquamarine/Beach Blanket Blue Wunder Unders have been recalled from store shelves due to not being up to standard. Apparently they were meant to be double knit but instead they where single layered. Looks like they are still relying on customers to be their quality control. In the meantime, check out the sheer white Gather & Crow crops (picture below) that were released last monday. I wonder if those are single knit or double knit ‘luon’ (aka ‘97% polyester’). Sheesh! Lululemon is kind of like Lindsey Lohan these days. Full of talent and yet a complete hot mess and totally exhausting. Such a shame. "Color Comparison: Pinkelicious CRB to Raspberry Glow CRB"
"Product Drop Monday: Silver Lining Tank, Short Sleeve and Long Sleeve"